When your work takes place outside in the cold, it is essential to wear a moisture wicking layer of clothing to keep your body dry during the working day. At MASCOT, you are offered a variety of comfortable thermal under shirts that take up very little room and are suitable as the inner layer under the rest of your workwear. 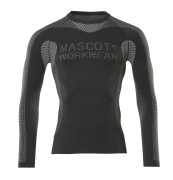 MASCOT's thermal under shirts are available in different designs and qualities. MASCOT's thermal under shirts have insulating and moisture wicking properties so you can stay warm and dry. They quickly and easily lead moisture away from the body and through the next layers, so that the inner layer does not feel cold and wet. MASCOT uses COOLMAX® in several thermal under shirts, because the material efficiently leads moisture away from the body. In addition, the thermal under shirts with COOLMAX® are quick drying, which is important in order to avoid getting cold. This gives you the best comfort regardless of your level of activity during the day. 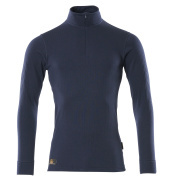 Several thermal under shirts from MASCOT are produced in an elastic and flexible material that adapts to the body's movements and gives you optimum freedom of movement. MASCOT's thermal under shirts are seamless and without stitching on the label, so the under shirt will not bother you when you move. The thermal under shirts are available in both short sleeve and long sleeve designs and in neutral colours such as black, navy and grey. If you have a job that requires extra high protection, you can find a thermal under shirt with multi protection. The multi-protective thermal under shirt is anti-static and flame-retardant, approved in accordance with the relevant standards.